Monday, Mar. 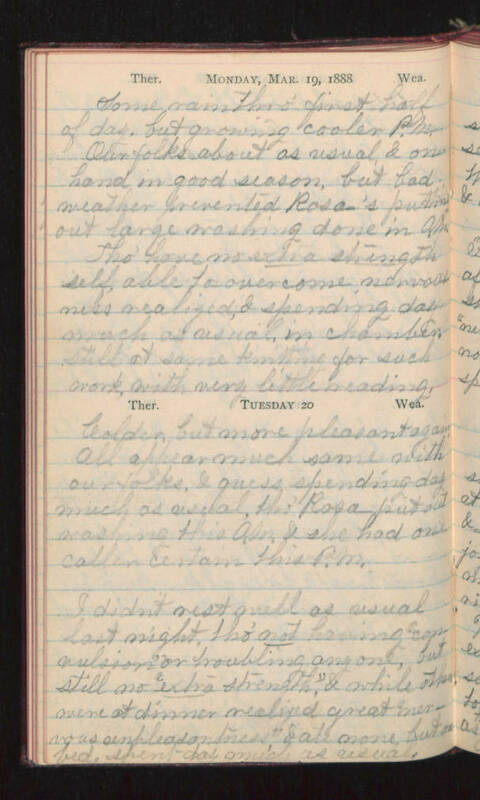 19, 1888 Some rain thro' first half of day, but growing cooler P.M. Our folks about as usual, & on hand in good season, but bad weather prevented Rosa's putting out large washing done in A.M. Tho' have no extra strength self, able to over come nervousness realized, & spending day much as usual in chamber, still at same knitting for such work, with very little reading. Tuesday 20 Colder, but more pleasant again. All appear much same with our folks, & guess spending day much as usual, tho' Rosa put out washing this A.M. & she had one caller certain this P.M. I didn't rest well as usual last night, tho' not having "convulsion" or troubling anyone, but still no "extra strength", & while others were at dinner realized great "nervous unpleasantness", & ate none but in bed, spent day much as usual.